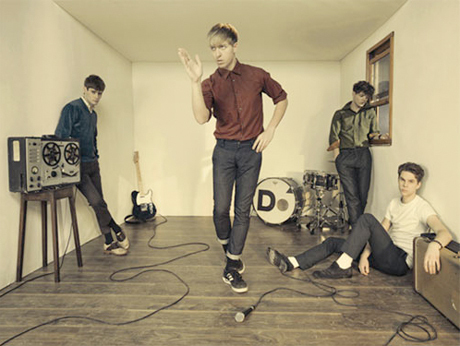 We already knew that the Drums have a penchant for dancing around and acting goofy on camera. The jangle pop outfit only have one album under their belts, but they've already released five music videos (if you're keeping track: "Let's Go Surfing," "I Felt Stupid," "Forever and Ever Amen," "Best Friend" and "Down by the Water"). Here's video number six; it's for "Me and the Moon" and is a barebones clip that shows the band hanging around in a gallery while frontman Jonathan Pierce does odd sidestepping dances in that shiny red jacket.